The Rev. Billy Graham preaching in 1955. The Rev. Billy Graham, who recently died at age 99, was one of the most influential and important evangelical Christian leaders of the 20th century. From humble beginnings in rural North Carolina, Graham went on to become a world famous evangelist who drew huge crowds while, at the same time, developing close relationships with several U.S. presidents. 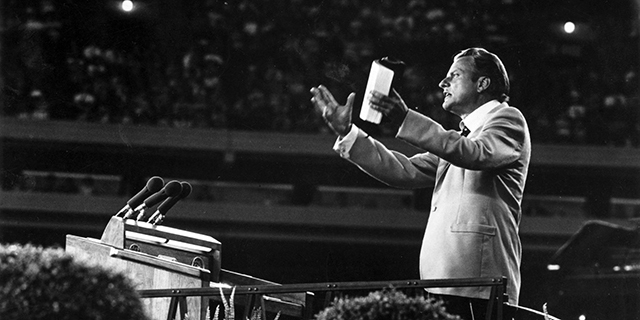 Graham is probably best known for the nearly six decades he spent traveling the world, preaching and evangelizing to millions in his stadium crusades. Graham also cofounded Christianity Today magazine, which remains an important chronicle of evangelical life and culture. Finally, Graham will be remembered as the “pastor to presidents;” he befriended and advised presidents from both parties, including Dwight Eisenhower, Lyndon Johnson, Richard Nixon and Bill Clinton. As the country remembers Graham, here are five facts about American evangelical Protestants. 1 About a quarter (25.4%) of U.S. adults identify with evangelical Protestantism, according to Pew Research Center’s 2014 Religious Landscape Study. In that survey, evangelical Protestants are identified mainly on the basis of their affiliation with evangelical denominations (such as the Southern Baptist Convention, the Lutheran Church-Missouri Synod or the Presbyterian Church in America, to name just a few) or with nondenominational evangelical churches. Evangelical Protestantism is the nation’s single largest religious group, exceeding the size of the nation’s Catholic (20.8%), mainline Protestant (14.7%) and religiously unaffiliated (22.8%) populations. 2The evangelical Protestant share of the population has dipped slightly in recent years (from 26.3% in 2007 to 25.4% in 2014), but more slowly than the mainline Protestant and Catholic populations. Though the percentage of Americans who identify with evangelical Protestant denominations has ticked downward, the absolute number of evangelicals appears to be rising as the overall U.S. population grows. In 2014, there were roughly 62.2 million evangelical Protestant adults, up from about 59.8 million in 2007. 3Three-quarters (76%) of evangelical Protestants in the U.S. are white, but the share of evangelicals who are not white is growing. As of 2014, 11% of adults who identify with evangelical denominations are Hispanic, 6% are black, 2% are Asian, and 5% identify with another race or as mixed race. 4On average, evangelical Protestants have somewhat lower levels of educational attainment, compared with the U.S. public as a whole. Roughly one-in-five evangelical Protestants (21%) are college graduates, while 35% have some college education (but not a four-year degree), and 43% have a high school education or less. Among those in the overall public, 27% are college graduates, 32% have some college experience, and 41% have a high school diploma or less education. 5Half (49%) of evangelical Protestant adults reside in the South, which is home to 37% of the overall U.S. adult population. Nearly one-quarter of evangelicals (22%) live in the Midwest (as do 21% of all U.S. adults), and 20% live in the West (along with 23% of Americans). Just 9% of evangelicals live in the Northeast, which is home to 18% of all U.S. adults.